What is the Federal Police Virus? What is the Federal Police Ukash Virus? As we do computer repairs, we have had several jobs in the last week and many in the last month removing this malicious virus and its getting cleverer all the time… We can remove this virus from your computer for a fixed fee of $145 so give us a call on 3397 1215 – 6 days a week, 8am to 6pm. To date none of our customers have lost any data, files, photographs etc when we have removed this virus from their PC or Laptop and we have had a 100% success rate in removing this virus. The Australian Federal Police (AFP) Ukash Ransom displays a bogus notification, that pretends to be from the Australian police and states that your computer has been blocked due to it being involved with the distribution of pornographic material, SPAM and copyrighted content. The virus locks your computer and asks you to pay a $100 fine for your “illegal activities” or else states you will be incarcerated! DO NOT PAY THE FINE, it will not unlock your computer. 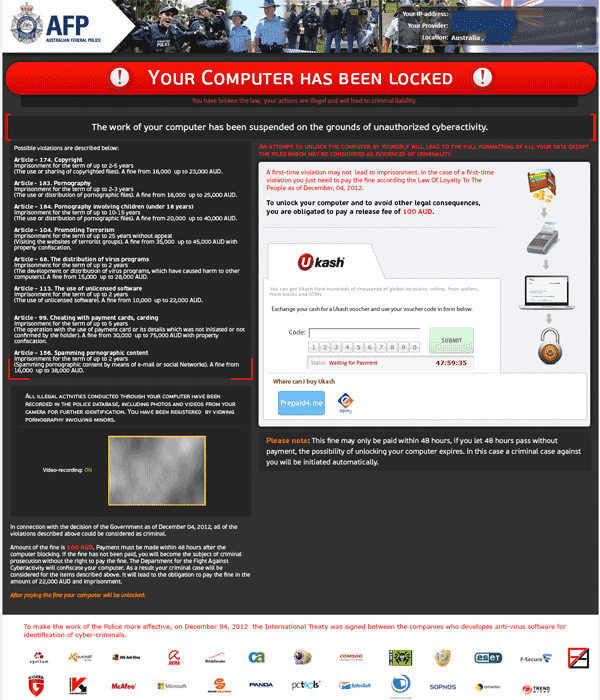 The Federal Police Ukash Virus is a scam used by cyber criminals for money extortion. If your computer is infected with Federal Police virus, then your screen looks similar to one of the images below. How Did you Get Australian Federal Police Virus Scam – even if you have anti-virus software on your computer? There are many ways whereby the virus can inflect your computer..
Browsing Malicious webpages – this occurs when you browsing webpages which contain various insidious agents which then enter the computer and make various changes in the system settings, browser settings, and Windows Registry settings. Peer to peer file sharing over a connected network – sharing various kinds of files such as freewares, documents, video or audio files, etc can also be the possible cause of Australian Federal Police Ukash Virus infections. Outdated security programs – you need to regularly update your anti-virus programs. Downloading free-wares or other data from untrusted links – the Australian Federal Police Malware Virus as well as most of the malware infections are caused due to downloading various data such as movies, ebooks, documents, music files, etc from the links or webpages which are completely or partially untrusted – often fee downloads are the problem. Once installed, Australian Federal Police Virus will start automatically when you start Windows. Once started, the Virus program will perform a scan and list a variety of legitimate or nonexistent files as infections. The Australian Federal Police Virus will try to intimidate you by flooding your machine with pop ups and fake system notifications. 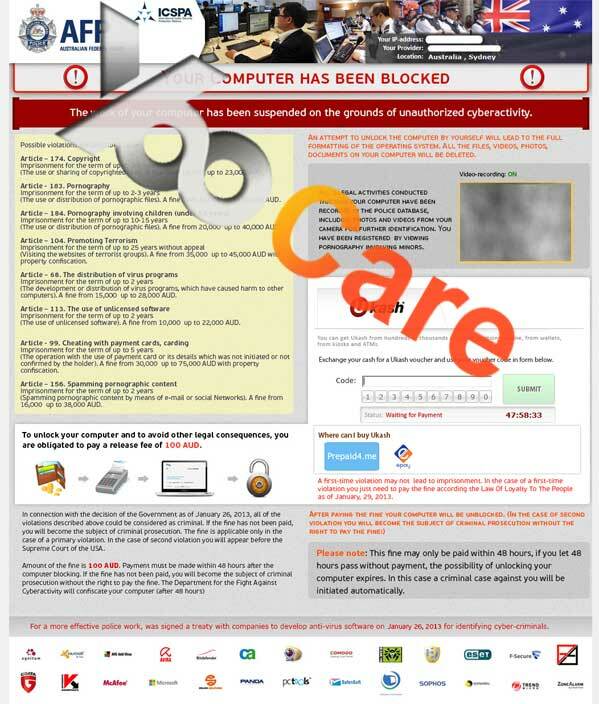 The Australian Federal Police Virus parasite will provide falsified system scan reports. This malicious virus will then execute a “scan” of your computer. This supposed “scan” will result in your computer being heavily infected and compromised by malware and spyware. It is critical to remove Australian Federal Police Ukash Virus and all its components. Danger’s of not removing Federal Police Virus infection as early as possible. This infection will change your registry settings and other important windows system files. If Australian Federal Police Ukash ransomware is not removed, it can cause a complete computer crash. Some ransomware infections contain trojan and keyloggers which can be used to steal sensitive data like passwords, credit card, bank account information etc. So it is very important to remove Australian Federal Police Ukash ransomware as early as possible before it steals your information. The Australian Federal Police Ukash ransomware may keep adding malicious codes into the infected PC or Laptop and execute them to make your computer become more vulnerable to virus, and these malicious codes may also disable the firewall and antivirus programs. Australian Federal Police Ukash ransomware is like having a big mine planted in your PC, it needs to be removed immediately to avoid other damages to your system and protect your precious data, files and photos. Research has shown that Australian Federal Police Virus may also have the ability to make your computer vulnerable to other remote attacks which could result, initially, in loss of money (if you pay the fine), possibly identity theft, and, eventually, a painstaking Australian Federal Police Virus removal process. The bad news, if you have this infection is that Australian Federal Police Virus blocks virus removal tools and system utilities, such as Task Manager and other can even change your desktop wallpaper. If you click on any desktop icon you’ll get a message that the program is infected and that you should buy Australian Federal Police Virus program to get rid of those infections. Please don’t trust or buy Australian Federal Police Virus program. It’s just a scam program. How do you remove the Federal Police Ukash virus? This virus in fast-mutating. We now we find it is no longer possible to simply run an anti-virus scan to remove the virus. The only way, to our knowledge to remove this virus is to take the hard drive out of your computer, put it in a second computer then run the virus scans. We run two different virus software programs to ensure that we remove not only the Federal Police virus but any other malware on your machine. This is a lengthy process and thus needs to be undertaken in our office at Coorparoo. We will remove this and other malware for a fixed fee of $145 and also install (with your approval) two other anti-malware programs which we recommend that you run regularly. Don’t be concerned if you have this virus – we can remove it with no loss of data. As this virus is evolving all the time it can get past many anti-virus programs, please call us on 3397 1215 and we will ensure your machine is returned to you virus free. For more information on viruses and virus removal click here Virus Removal in Brisbane.